Do you reckon they would take £50 a corner for the wheels? Gutted for the owner as it is someone's pride and joy.....but "it'll buff out". It’s the local authority who are at fault. 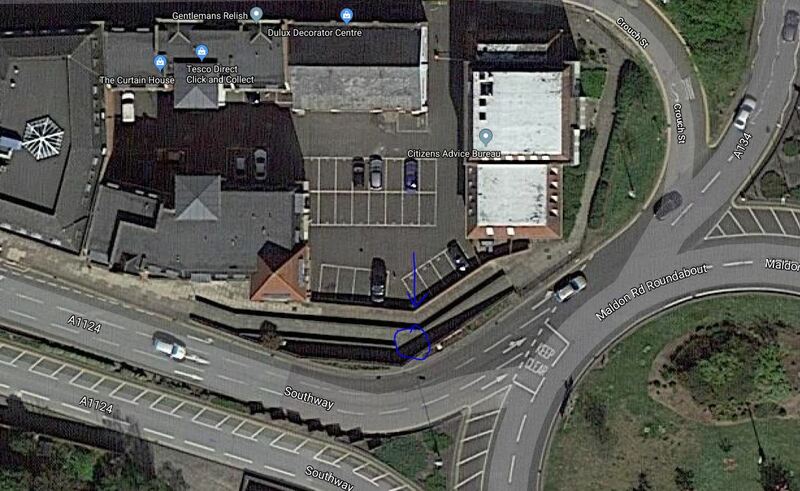 Who would be so stupid that they built an underpass just where an aged pensioner parks his 180 mph, £100,000 mobility scooter. My dad is 73 and is still building houses. He'd run rings around people a third his age. Take a look at some of the yonger generation driving nowday's, some havent got any grey-matter between their ear's and the driving is atrociously dangerous - not all are like this, but some are just crazy !! Being local to me, I'm struggling with how he managed to go so far (unless the wall stayed pretty much together and acted as a ramp to it's final resting place. Maybe he'd just got some bad news at the Citizens Advice Bureau (as it is their car park!) and wanted to damage the car. Impending divorce or something. Perhaps he’d just come out of Gentleman’s Relish at top and was still shaking? Well according to that lot on FB hes hung drawn and qtred, I get Cassies law but hear the dam facts first . Then the typical socialist comment halfway down starts on about show offs in expensive cars and 6k fines not meaning much to them . For gods sake get a frigging life and stop being bitter and twisted about people who have been luckier in life than you . It's gets me as well when people say how lucky you are, I always reply yes it's funny the harder I work the luckier I get. Couldn’t agree more!! Yes a bit of luck plays a part but hard work and taking a risk plays more!!! I have a different 'Ouch Targa' tale of woe. Bought one from Williams-Crawford, as it was too far to inspect and so I based my purchase on (misplaced) trust. Very cheap brake pads/disks. Masses of black brake dust always evident. Belt and pulleys old and worn, snapped at 30mph. Kind of Grand Theft Auto. Naturally the company didn't make good 90% of faults and wouldn't take the car back after 3 months my having hardly used it (surprise surprise - wonder why...). Obviously in some instances 'reputation' counts for nothing. No exaggeration here. I believe cases like this should be flagged up as warnings to others. My knowledge of the model was limited at the time (1 year ago) and most of the issues were not apparent until later when putting it with a couple of local specialists. I didn't have an inspection done as I took Williams Crawford's absolute assurances about the car. More fool me. I subsequently received a rather aggressive call from the company telling me they had no intention of taking the car back. This was within 3 months of ownership. My mother had died and I needed to raise funds at that time. The company is scum. Good luck to anyone who buys from them. if you run into trouble you're on your own, mate.